Tomorrow will be my first Memorial Day in Elderberry Bay, also known as Threadville. When I was growing up in South Carolina, I spent Memorial Day weekends with my Gramma. She lived in a small village known for its Memorial Day celebrations. In the morning, she took me to the parade. I always dressed in red, white, and blue. We both brought flags and nabbed a spot right on the curb. People marched past, and Gramma stood there, waving her flag and crying. I could not understand why she always wanted to go to parades if they made her cry. Beautiful? Cub scouts scuffed past in their uniforms, and Jeffie, the kid who lived across the street from her, caught me smiling and stuck his tongue out at me. What did he think, that I liked him? Gramma sobbed. The music from the brass band vibrated through my whole body, and I wanted a uniform, too. But not like Jeffie’s. I wanted a shiny red and white one with gold braid and buttons. Then we’d go back to Gramma’s and she cooked hot dogs and let me pour on as much mustard as I wanted. I got to drink root beer right out of the can. She always said I could decorate my bike and be in the parade if I wanted to, but if she was going to cry, I needed to be with her and comfort her. At night, we went to the village square and listened to a concert in the bandstand, and when I stayed awake long enough, we watched the fireworks. Each time one unfurled above us, Gramma called out “OOOOH!” Tucking me in later, Gramma told me about her father, who had gone off to war. If we remembered him and others like him, she said, maybe kids like Jeffie wouldn’t have to wear uniforms. Wouldn’t have to? Eventually, I took up the trumpet, but I lasted all of about five lessons, and I never got the shiny uniform. I could make one, I suppose. Threadville is all about creativity. In Elderberry Bay tomorrow, there will be a parade down Lake Street to the park where the Elderberry River meets the beach on Lake Erie. We’ll all follow the tail end of the parade so we can greet the Great Canoe and Kayak Race competitors, winners and losers, as they come in after their hours of paddling. There will be hot dogs. I will coat mine with mustard. I will drink too much root beer. In the evening, the Fraser Construction Brass Band will give a concert in the bandstand. I hear that their uniforms are red and white, trimmed with gold braid and buttons. I can’t wait to see and hear Clay Fraser playing the trumpet. I know, it won’t be like Memorial Day with Gramma, but her memory will be with me. I may even shed a tear when the Cub Scouts and Brownies march past. What special things did you do on Memorial Day when you were a kid? What special things do you do now? 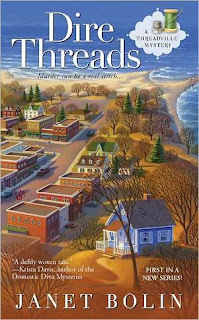 DIRE THREADS, the first book in the Threadville Mystery series, will be in stores and downloadable as an e-book on June 7. Note from Janet: Remember last January, when Dorothy Parker, fresh from a murder investigation, visited Killer Characters? 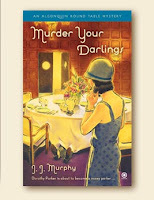 J.J. Murphy, author of MURDER YOUR DARLINGS, is running a fun contest with great prizes. Click here to learn more about it and enter! Hey Willow, it's almost here. Readers will hear your stories next week. We use to go to the big parade in the city and it was fun watching all the marching bands and we'd jump for joy when we saw a friend. Dru, can there ever be enough marching bands? I guess I'll be doing a lot of jumping tomorrow when I see friends in the parade. Willow, I don't specifically remember Memorial events other than family BBQs, but I remember my grandmother. So proper and not a touchy geeky woman, but she adored us and her eyes twinkled with delight as she introduced us to theater and books and symphony. I will forever be grateful. All holidays were spent with my mother's huge family, either at Grandma's or on one of the farms my aunts and uncles lived on. Lots of food, fun romping with the cousins (13 of us), fireworks shot off by the older cousins after dark. Good times! My Swedish grandma would sit and watch, after a day of cooking, with a beautiful satisfied smile. Thanks, Avery and Kaye, for your memories of Grandmothers, family and cousins. Thirteen cousins, Kaye, wow. What fun. Willow, your grandmother sounds like she was a wonderful lady. My younger brother and I used to dive into Lake Michigan on Memorial Day, but now that I'm older and understand the concept of hypothermia, my husband and I attend the local Memorial Day parade, which ends with a solo trumpter playing "Taps." Make me cry, every time. Forget the parade, I'm eager to see Clay in his snazzy uniform. I bet that sets off fireworks for Willow! Oh, Laura, Taps! Who doesn't cry at Taps, especially that last note, drawn out, echoing . . . I would cry if I dove into Lake Michigan or any of the Great Lakes on Memorial Day. Brrr! Ha, Krista, very funny. I only want the uniform, and the musical ability, of course. That's all. What great Memorial Day memories you have. My memories are of warm weather and barbecues. And being off from school, of course. Marilyn, no school that day - a promise that summer vacation was about to start! And it was already hot. What great memories, Willow! Hope it's a good one for you. I'm sure it will be a great day, Erika. It's not what Janet wrote about in DIRE THREADS. She tells me I'll have another adventure, but it won't be tomorrow. Being the protagonist in a murder mystery series can be unnerving. I grew up in a small town in South Carolina, too! Unfortunately, we didn't have a big Memorial Day parade. After my father put flags on the veteran's graves, we usually packed up the station wagon (with wood sides) with tea and sandwiches and headed to the beach for the day. On the ride home, I'd close my eyes and could still feel motion of the waves. We had a wonderful time! One of my best memories of my Gram is that she'd have my brother and I pick elderberries so she could make an elderberry pie. Best pie ever. I love that your town in called Elderberry Bay and even though this isn't a Memorial Day memory, it is a memory of my Gram. Great post! A day at the beach, Dorothy, that would be memorable, too! Jenn, Gramma and I used to bake pies together, too, and I still have her pie crust recipe. Don't elderberries have lots of little seeds? Well, I forgot completely about going out to the graveyard and setting vases filled with water and peonies, if we had them, on Grandpa's grave, and some other relatives whose relationship I wasn't quite sure of. The vases would tip if it was windy and someone would have to go back later and collect them. But having peonies by Memorial Day in northern Illinois meant the year was on track.